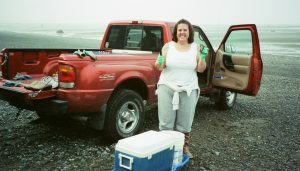 Debbie clam digging in Alaska (her current home state) in 2005. It’s a common pipedream for many aspiring writers: to give up all material possessions and hit the road in search of adventure and quiet, inspirational places to write. For ScanMyPhoto’s customer Debbie LaFleiche this dream is about to become a reality. Debbie’s plan is to supersize life by selling her home, drastically downsizing material possessions, buying an RV, and hitting the road. This new life will enable her to see the country, cut back on living expenses, and find lots of time and beautiful places to write. 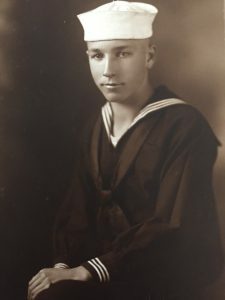 Debbie’s grandfather Zener LaFleiche, taken in 1918 when he was just 17 years old! But as Debbie started to downsize she was faced with a challenge when it came to preserving her family’s print photos. Now that Debbie’s precious memories are scanned and preserved, she continues to focus on the logistics, finances, and general downsizing aspects of her big goal. So, where does she plan to go once she hits the road? Debbie’s big deadline to ship out is October 1, 2017. 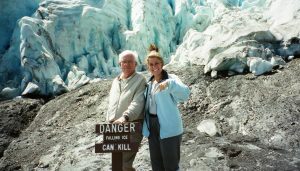 You can follow her adventures and gain lots of excellent downsizing and RVing tips on Supersizelife.com. Personally, we’re looking forward to seeing all the incredible new photos and memories she’ll capture along the way. This entry was posted in Customer Stories and tagged customer story, downsizing, photo scanning, Supersize life by Monika Jansen. Bookmark the permalink.